How can i update the XEXUN TK102 firmware by USB? This tutorial will show you how to update the XEXUN TK102 firmware with FLASH MAGIC and the correct USB cable with the PROLIFIC PL2303 driver called USB-to-serial driver. Why flashing your XEXUN TK102 firmware? You hope for a better performance or something else? Please forget that. Flashing your XEXUN TK102 with flashmagic is too risky. If FLASH MAGIC crashes while firmware update or the connection is lost this can cause the tracker to get inaccessible. Maybe you can never access the tracker again in that case. Never touch a running system, if the tracker is working as designed, let the tracker do its work. A firmware update on your TK102 should only be done in case of emergency or malfunction, for example if the tracker LED is flashing fast permanently. Flashing your TK102 firmware with FLASH MAGIC is like throwing a marble through a basketball basket from the other side of the field, possible, but you will need some tries. Before you can start you need a firmware update cable. As you cannot use a common USB cable you need an original XEXUN TK102 USB firmware update data cable. The most common error message in a firmware update process is the autobaud error, and that message can nearly mean everything. We will get back to this error later. Because XEXUN doens't offer an own firmware update software we need to use an external tool called Flash Magic. 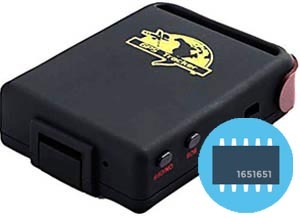 Flash Magic is a PC and MAC programming tool for flash based NXP microcontrollers by RS232 or USB to serial adapter. NXP is a manufactorer of microcontrollers and processors. The built in CPU of a XEXUN TK102 is usually ARM7 from NXP. And because of that we can use the Flash Magic tool. Download Flash Magic Version 10.01 for Windows XP/Vista/7/8/10 here or Flash Magic Version Version 9.60 for MAC (OS X 10.6+) here. Connect your USB to serial cable to USB and open your windows device manager (Start Control panel System and Maintenance Device manager). The device manager will open in a new window. Look for Ports (COM & LPT), click the . If you see an entry called Prolific USB-to-Serial Comm Port (COM26) or similar note down the value in brackets. In this case we are using COM26, but this value may vary. Open Flash Magic. Remove the USB cable from your computer AND from the tracker. Enter following settings. Depending on the Flash Magic version you need to press the Select button and choose the ARM7 menu tree. Look for LPC2134 and choose that value. Choose the HEX file you have downloaded before. Don't use another HEX file from a source you don't know or you don't trust. Using a wrong firmware file will damage your tracker. By the way, do you spend money for your mobile GPS tracker traffic? Yes? Why? GPS tracking is possible without monthly fees for your SIM card. Learn more and read our article FREE GPS tracker sim card in UK. Once completed your Flash Magic window should look like this. But please take care. Wrong settings can destroy your tracker. Now you need fast fingers and both hands. Plug the USB cable into the tracker (still disconnected from the computer). Move your mouse pointer to the start button. Plug the USB cable into your computer and as fast as you can, click the start button. If the tool has successfully connected by software serial the title bar of the tool will change to Flash Magic - NON PRODUCTION USE ONLY - Using xxxxx baud (depending on the baud rate you have entered before). If software connection failed you will get a autobaud error message called Operation failed - failed to autobaud. Close the message popup window, remove USB from tracker and computer, and repeat. Maybe you have to do that many times. The autobaud error is the most common error message. There are many reasons why this message could appear. Flash Magic tells us something about autobaud error in their forum. The most common problems causing such an autobaud error are device failures, USB driver issues or the wrong USB cable.